I'm hoping to get caught up on my challenges before the Labor day weekend. Here is my card for the challenge over at Pins. The elderly couple image is from BUGABOO STAMPS along with the sentiment on the flowers. The flowers and the heart frame are from Pixel Scrapper. I used Spectrum Noir markers to color the image and Stickles Ice Diamonds to add some bling. I really like how the flowers sparkle. Be sure to stop by and see what the talented DT has for your inspiration and join us in the challenge for a chance to win some digital images. Thanks for stopping by today and leaving your comments. Be sure to follow me as I get ready to start some holiday projects. Have a happy crafty day. 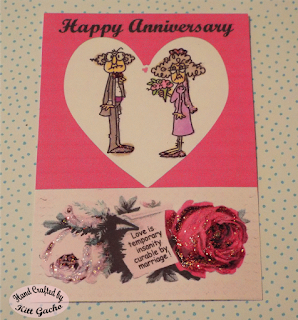 Kitt, your anniversary card is so cute!